Visit the Angkor Thom and marvel at these awesome four-faced giant monolithic figures curved from rocks at the Bayon - The Center of the Universe. 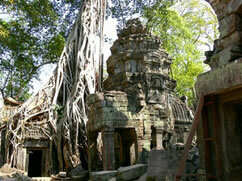 Then make your way to the Ta Prohm temple, where the world famous Tomb Raider movie was shot . 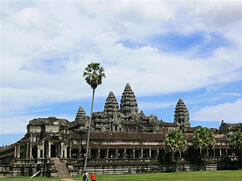 After lunch, spend the excellent afternoon by discovering the Angkor Wat, the world’s largest religious building. At last, finish your day with amazing sunset on top of Phnom Bakheng! Enjoy a traditional Shadow Puppet or Apsara Dance show for only USD 10 per person. We also take a detour at Prasat Sour Prat, Terrace of the Leper King and Takeo depending on your request. Q: For private car tours, is it possible to skip some attractions even if they are mentioned in the itinerary? *Minimum 2 pax per tour / If you would like to go on a private charter (one guest and guide only) and as per our tour policy, we will charge you on a 2 pax basis+$5.